Available with the SKU’s for Northcott Shimmer Sandscapes fabric! 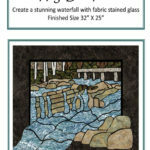 Create a stunning stained glass landscape in fabric. Raw Edge Fusible Applique on a black background is used to create a nature scene. Two different finishing techniques are explained. 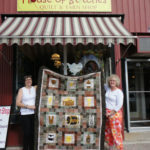 This project is a great introduction to stained glass quilting. The “Narrows” at Bon Echo Provincial Park near Cloyne, Ontario is a gorgeous place to just sit and contemplate the majesty of our natural world. Mile high cliffs rise from a deep clear lake, and you can almost reach out and touch them from this peaceful bench placed at the point.